I wanted to thank you again for such a fun workshop yesterday. We all loved coming to 3 Plum Hill, seeing your beautiful garden and enjoyed your inspiring demonstration. You organized such a wonderful day. 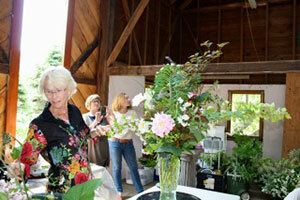 We loved hearing about how you developed your garden and then loved watching you demonstrate your arrangements. We learned so much and clearly left feeling inspired. Everyone had a blast playing with the greens and flowers afterwards. Your barn was buzzing with flower spirit. I hope we can all do it again in the not too far distant future. Everyone was so happy they joined in and hopes we can do more workshops ahead. Thanks again for organizing a perfect day and for sharing your beautiful garden and knowledge. Let's stay in touch. 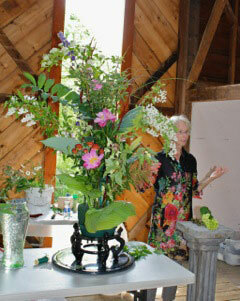 or a party to put together flowers for a celebration. Cost: Please call for individual or small group rates. Materials: You can bring your own or I can provide! Material cost if I provide: $30-$50.00 a person depending on selection and season.